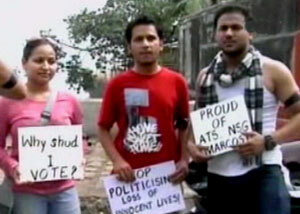 After the Mumbai carnage, angry voices are now heard on the street, on the web and in phone inbox. And they are saying only one thing — enough is enough. In one such campaign, text messages by anonymous senders drew crowds on the streets at Colaba. Citizens gathered after an SMS did the rounds to protest against politicians who did nothing to stop the terror attacks. The carnage in South Mumbai has ended but it has started a a citizens’ movement — a movement which is gathering momentum on the Internet and via mobile text messages. And on popular social networking site Facebook, home truths that hurt. Four days after the carnage began, the protest had spread. Protesters took out a candlelight march from Marine Drive via the Trident and finally to the Taj. They were shocked at the brutal terror attacks and their grief turned into anger; anger directed at our politicians. “Initially, I saw journalists ducking when the shots were fired. Then by the third day got used to it,” said actress Juhi Chawla. After the attacks, the people of Mumbai are demanding accountability and will settle for no less. This entry was posted on Tuesday, December 2nd, 2008 at 3:43 am and is filed under Share your views. You can follow any responses to this entry through the RSS 2.0 feed. You can leave a response, or trackback from your own site. Another Shooter dies, fighting with terrorists (Saving our country and our live) & government pays his family 5 lakhs. Our forces can easily defeat them. WORRY about those who have come thru votes…. forget the martyrdom of these brave Jawans. cricketers should be paid the salaries of the Jawans. shooter dies while shooting terrorist, govt gives 5 lakh. WHO DESERVES MORE? Huh.. This is our India…. Please be a patriot and forward this to everyone u know. Really great!!!!!!!!!!! Hats off to India !!!!!!!!!!!! !